Manage every opportunity with our sales CRM so you can generate more revenue fast. Whether it’s a single event, seasonal contract or rain day reshuffle, our drag and drop scheduling makes managing your schedule a snap. See real-time information about your crews’ progress, so you always know how their day is progressing. Unlike other solutions, our Customer Relationship Manager aligns with the way lawn maintenance businesses manage customer information. Contacts and management companies are assigned to properties, eliminating duplicate data entry and making it easy to access your work history, contracts, property information and more. See a complete history of all the work you’ve completed on a property. Assign multiple contacts, sales opportunities and even add project management companies. Unique fields for your lawn maintenance business delivers more information on a property—like the square footage of lawns, flower beds and more. Paper schedules and route sheets are so 1999. 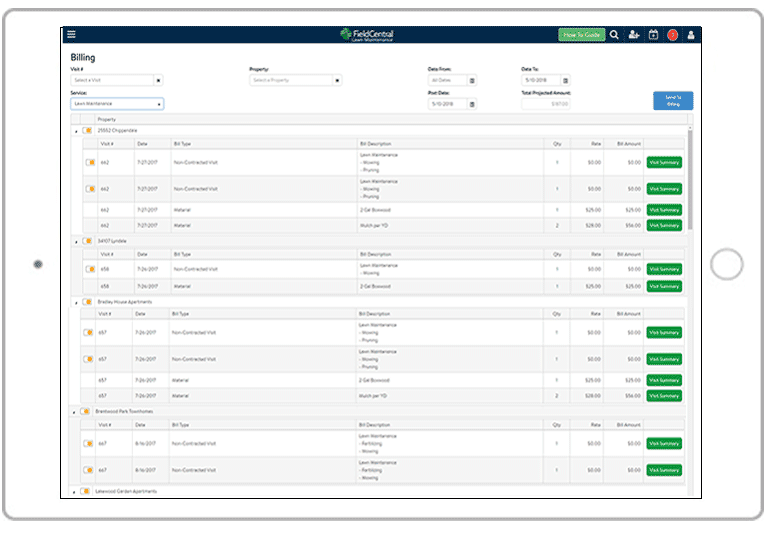 Not only does FieldCentral’s calendar give you real-time information about the status of your jobs, but it also makes it easy to schedule an entire contract’s work, easily shift your calendar for rain days, and can even replicate changes to one day over multiple like days should you add a new customer to a crew’s route. All in an intuitive, drag-and-drop interface. Need to adjust a day? That’s as easy as dragging and dropping events on your schedule. 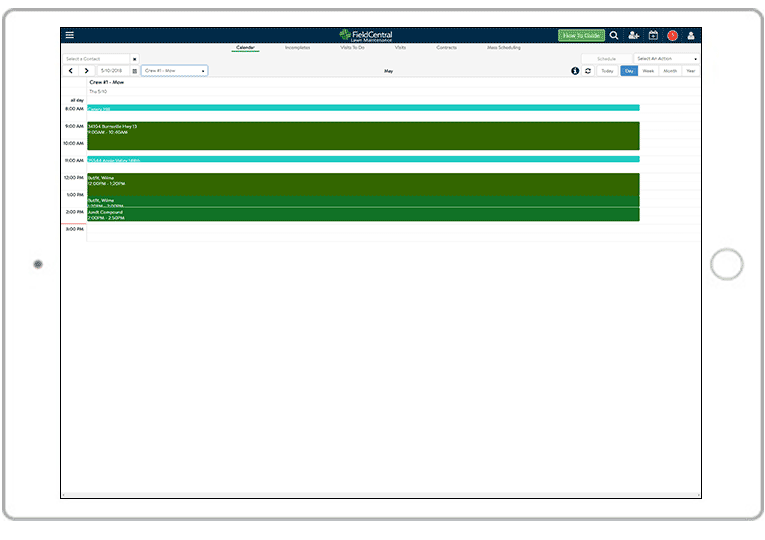 FieldCentral enables you to create routes, and then schedule those routes on a yearly calendar. It’s a great way to get all of your contracts onto the calendar quickly. Plus, we’ll optimize your routes for you, so you save windshield time. Managing your schedule because of rain days is a drag. With FieldCentral’s rain day functions, you’ll be able to move entire days or strings of days in the schedule. Tracking and communicating with your crews can be a pain. But not if you’re using FieldCentral’s field app. Send notes, customer data and more electronically to your crew’s Internet-connected smartphone and tablet. 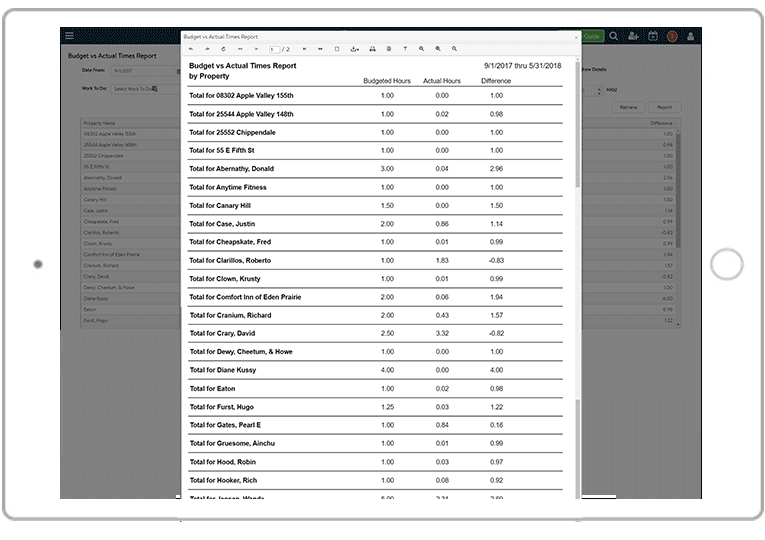 Capture time in and time out data for true job-specific profitability information. And, have your crews mark jobs as complete so you can see how they’re progressing throughout the day. If you want to simplify field data capture, simply have your crews mark jobs as complete or incomplete so you can see their progress throughout the day. To capture a true accounting of the profitability of each customer and crew, you’ll want to capture time ins and outs. Want to know how much mulch was used on a project? Your crews can input materials used in the field. See how FieldCentral can help you. Don’t worry, you don’t have to learn a new accounting platform to use FieldCentral. We integrate with leading accounting platforms like QuickBooks Desktop and QuickBooks Online. 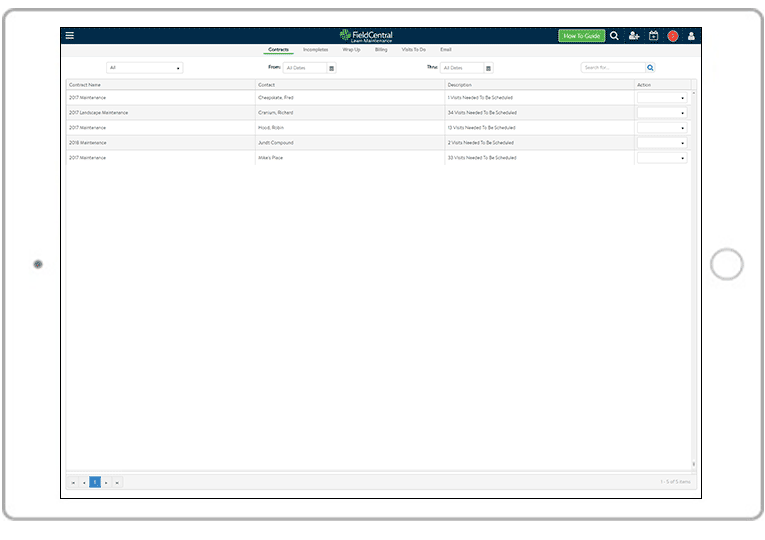 Moving data between QuickBooks and FieldCentral is a breeze thanks to our unique two-way sync. Do the Work. Review. Send. FieldCentral makes it easy to review your work before you send it to QuickBooks, so you can add notes, modify remarks and more. Our sync means you can import data from QuickBooks - like customer information, parts and information - and eliminate duplicate data entry completely. Where most software solutions merely help you collect information and do things like schedule and bill, FieldCentral goes a step further. Our unique Needs Attention feature alerts you to items in your business that require action, ensuring your business operates smoothly. 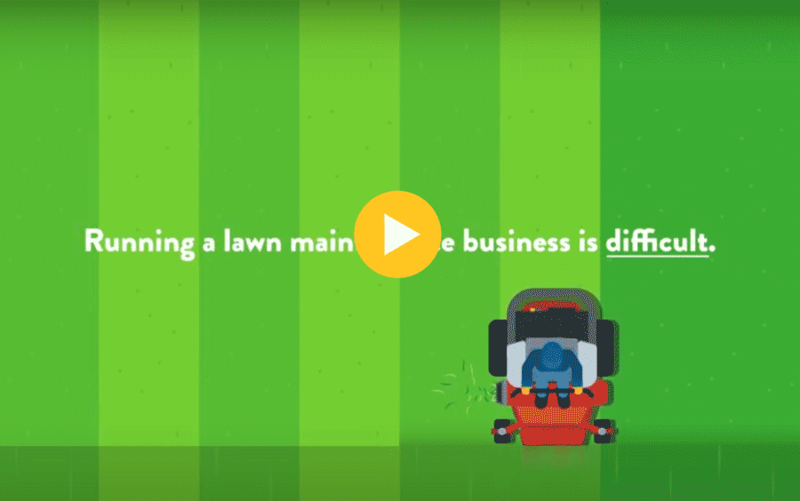 It's like adding artificial intelligence to your lawn care business. Have a contract coming up for renewal? Still have four bi-weekly visits to schedule? We'll remind you of these events so nothing falls through the cracks. It happens. A customer will ask you to do something not covered by the contract. You do it, but how do you bill for it? Needs attention will identify work done outside of a contract and enable you to review the work and assign a dollar value to it, if necessary. Bill on Time. Every Time. 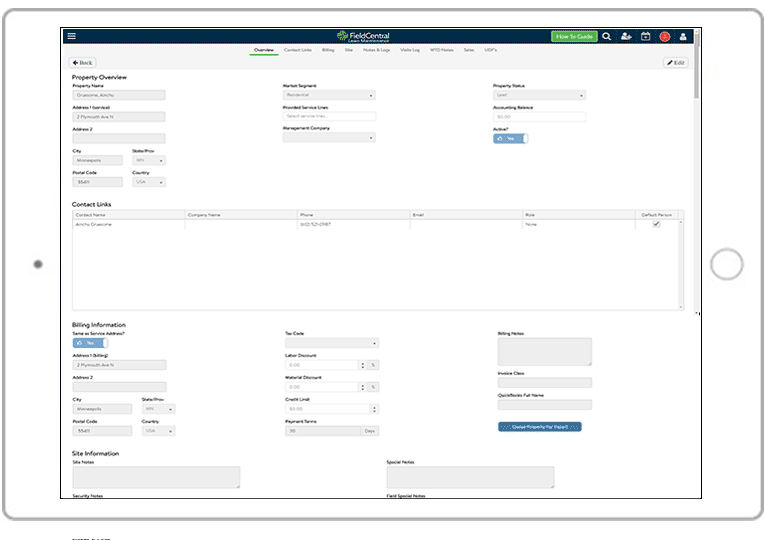 FieldCentral's Billing Needs Attention alerts you if you've forgotten to send monthly recurring invoices to QuickBooks as well as any other invoices that need to be sent. Wondering which customers are most profitable? Curious which crew generates the most revenue per hour? Want to see an analysis of productive and non-productive time? A few mouse clicks is all it takes. It’s data that will help you make decisions that improve your business. Leverage FieldCentral's Crew Revenue Report to see which crew generates the most revenue per hour. Even better, create an incentive program around this number to encourage a more productive team. The most powerful report you can review is the Budget vs. Actual Report. It will show you your profitability by customer, crew, service and more, all data you can leverage to improve your profitability. Report and export your timesheets in minute detail so you can see exactly what your employees did every single day. The one-time startup fee includes all the training and support you need to get started taking control of your business. The first module is $99.99 and additional modules are $79.99 each. Today, FieldCentral has irrigation and maintenance modules available. Whether it's an owner, an office manager or a crew, you'll pay $24.99 per user, per month. The first 300 contacts you have in FieldCentral are free. After that, you'll pay $9.99/mo. for every 300 contacts.